This 12 day trip combines a total package in offering the best of nature, culture and of course, the Komodo Dragons. As opposed to a trekking tour, this trip provides a more leisurely approach to the islands and lets you experience how wonderful the people are and where they live. If you have the time, this will offer you the maximum in discovering wonderful Flores! After breakfast at the hotel, you will depart and drive to Larantuka, the capital of East Flores. This coastal town used to be a naval base for trade and a central point for colonial and clerical activities in East Indonesia. Nowadays, Larantuka is still an important connecting port to the neighboring islands and the center of economic activities of East Flores, attracting many people from the surrounding villages to make a living in the town. On the way, you will stop at Boru Village where you can see the volcano called Mount Lewotobi as well as a coffee plantation in Hokeng. A stop at Titehena will give you a beautiful panorama of Konga Bay and Lewotobi. Have dinner and stay overnight in Asa Hotel Larantuka. Upon completing breakfast, you head out to visit beautiful Meting Doeng Beach in the morning, followed by the Larantuka city tour to visit the Reinha Rosari Catholic cathedrals built in Portuguese style. We will also spend time at the harbor, and local market allowing us excellent chances to meet with the local people. Upon returning to Maumere, we have some free time to experience the town or actually laze on the wonderful beach. We have dinner and stay overnight in Sea world club Hotel. After breakfast, you will depart from the hotel to visit ther Ledalero Museum located on the outskirts of Maumere. The museum has an interesting collection of ethnological objects from the region. Ledalero is named after a major Catholic seminary that produces many Florenese priests. You will continue to Sikka Village, a district very famous for its traditional ikat weaving using organic dyes. After you enjoy the serenity of Paga Beach, we will continue by having a leisurely trek to Jopu and Ranggase villages in the afternoon. Stay overnight in Kelimutu Eco Lodge Moni. We arise early in the morning at 4:30 to drive/hike up and experience sunrise at the top of Mt. Kelimutu where exists three exquisitely colored lakes that consistently change color over time. This is truly one of the most spectacular and mysterious sights in Indonesia. We return through winding roads along the mountain side to your hotel for breakfast. Afterwards, we continue your trip to Ende and on the way we visit Saga village, which is a traditional village of the Ende Lio tribes. We will lunch at restaurant in Ende before driving along the coast and up to Bajawa sitting higher in the mountains. We will arrive at our local destination for the night and have dinner in Pondok SVD Riung, a Bena Traditional Village. This will allow us to really enjoy our time with the local culture and see how they live. After breakfast we set out to do some island hopping around the 17 islands of Riung, which is a chain of large and small islands called Pau, Borong, Ontoloe, Dua, Kolong, Lainjawa, Besar, Halima, Patta, Rutong, Meja, Bampa (Tampa or Tembang island), Tiga (Panjang), Tembaga, Taor, Sui, and Wire. All the islands are uninhabited and their coastlines are pure white sand beaches. We will get to witness the flying foxes at Ontoloe Island along with enjoying a swim, snorkel and relaxation on the white sand beach. A very relaxing, pleasurable day of peacefulness at these Tiga and Rutong Islands. Stay overnight in Pondok SVD Riung. In the morning after breakfast, you will experience the drive from sea to mountains as we drive up to Bajawa, a small town located 1200m above sea level and indulge your senses with wonderful scenery along the way. We enjoy some of the local area, such as taking a warm bath at the hot springs in Soa before going on the Bajawa city tour in the afternoon. Stay overnight in Happy-happy Hotel or Silverin Bajawa Hotel. Your first visit after breakfast is to a unique local village, Bena, an ancient Ngadanese village that takes 1.5 hours by car to reach from Bajawa. We can see and appreciate the unique way of life, the traditional houses, and the ceremonies that are steeped in a long-preserved tradition. Here, time still stands still with the locals still practicing some of the pagan beliefs they have held on to for many generations. After visiting, we continue our drive to Aimere, famous for its arak, which is the local palm wine distillation, and do a short trek along the rainforest trail of Ranamese’s crater lake. Stay overnight in MBC Susteran Ruteng. In the morning, you will be driven to Tengkulese Waterfall in the northern part of Ruteng. The two-tiered waterfall, also referred to as Cunca Lega (cunca means ‘waterfall’ in Manggaraian) and is named after the nearby village. The one-hour trek to the waterfall is set around a lush forest and rice terraces. You can also swim here if you wish. We then return to Ruteng in the afternoon and visit Liang Bua, an archaeological cave where the Homo Floresiensis was founded by Indonesian and Australian archaeologist, also known as “Hobbit” cave. Stay overnight in MBC Susteran Ruteng. You will depart from the hotel after breakfast and head to Golo Curu, a hill where you can admire the scenic view of Ruteng and its famous rice terraces to the north. This truly unique fields are formed in the shape of spider web’s and provide stunning visuals of the area. 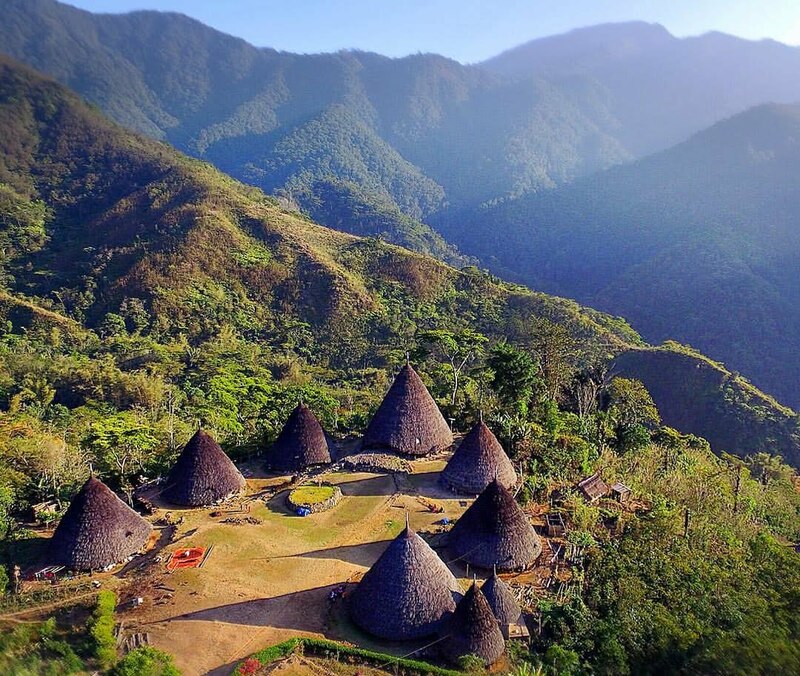 Then we continue on to visit Ruteng Pu’u which are the traditional houses of the Manggarai tribes. We can experience their unique culture and then continue to Cancar to see the unique Lingko, circular rice fields arranged that are also shaped like a spider web. We will then drive directly to Labuan Bajo for a sail to Rinca Island on our house boat. Dinner and overnight on the boat. You will arise early in the morning to go on a 1-2 hour morning trek on the island Rinca to catch our first experience with the mighty Komodo dragons in the wild. We continue on to Komodo Island where you go on another trek for a couple of hours along the savannas and hills to lay witness to more of the dragons, their prey and the unique vegetation of this area. After back to the boat, you will sail on to Pink Beach for a relaxing swim and snorkel before sailing back to Labuan Bajo. Stay overnight in Puri Sari Beach Hotel Labuanbajo. After breakfast, go on a morning visit to Batu Cermin before departing to Denpasar.